Volvo XC90 Passenger car limitations are tested and broken by the VOLVO XC90. The model boasts an abundance of advanced technology that supports you during your normal journeys and when you face difficult conditions. It also seats up to seven to make it a worthwhile addition to any family. INTERIOR DESIGN The interior strengthens the XC90’s reputation as a family favorite. Inscription-branded scuff plates in the related model are a small but welcome design detail. The R-Design name is seen on this version’s headrests to distinguish the iteration further. Slide back the cover on the sunroof to allow natural light into every corner of the cabin and let all admire the intuitive arrangement. Maximum torque of 400Nm will pull a full car plus luggage with no difficulty. The key to this is our new light weight, low friction 2.0L super and turbo charged engine which is coupled with a newly designed automatic 8 speed Geartronic transmission and all-wheel drive. Looking out for you Your XC90 looks out for potential danger, helping to protect both those people in the car and those outside, day and night. We call this innovation City Safety and it uses radar and camera technology to identify potential hazards such as other vehicles, cyclists, pedestrians and large animals ahead. Keeping you on the road The XC90 can protect against one of the most common types of collision - when a vehicle leaves the road - less likely to happen. Run-off road Mitigation can detect if the car is about to leave the road unintentionally between 65-140km/h and can then use steering and, if necessary, brake support to guide the car back onto the right path. Please note: the driver is responsible for how the car is controlled at all times. Designed to protect Safety is at the heart of the XC90 and is the result of decades of innovation. Ultra high-strength boron steel – one of the strongest types available – forms a rigid safety cell around the car’s occupants. Safety belt pre-tensioners and load limiters keep the belts in just the right state of tension while not exerting too much pressure on the body. Passenger car limitations are tested and broken by the VOLVO XC90. The model boasts an abundance of advanced technology that supports you during your normal journeys and when you face difficult conditions. It also seats up to seven to make it a worthwhile addition to any family. Two unique model editions add a distinctive finish to the already bold XC90. The Inscription version is a demonstration of Swedish design expertise and like its alternative includes stylish alloy wheels, elongated tail lights and a purposeful posture. R-Design is the second in the range and one that has a sportier character. Dual exhaust pipes are integrated with the rear bumper skid plate, and similar protective guards are found at the front and on each side. Front fog lights increase visibility while also drawing attention to a familiar front section. The interior strengthens the XC90’s reputation as a family favorite. Inscription-branded scuff plates in the related model are a small but welcome design detail. The R-Design name is seen on this version’s headrests to distinguish the iteration further. Slide back the cover on the sunroof to allow natural light into every corner of the cabin and let all admire the intuitive arrangement. Intelligent technology raises the car’s usability to a new high and benefits every single occupant. In the middle of the dashboard is a color display that shows information on every feature of VOLVO’s Sensus infotainment system. It connects you with the world beyond the cabin by integrating with your smartphone. 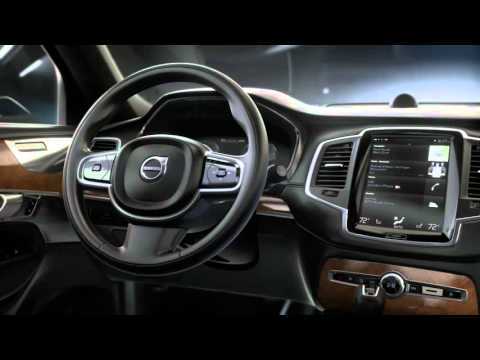 This enables you to take calls hands-free and use the VOLVO On Call app to control the model from the outside. Access digital radio stations to remain entertained and informed, or view straightforward directions to any destination via built-in iGo satellite navigation. A wide range of optional extras mean you can fit the XC90 with the equipment you demand personally. Rain sensors activate the windscreen wipers automatically when it begins to rain to remove one common distraction. You can also specify an extra power outlet to charge more devices as you drive. Effortless performance that you can depend on comes from the all new Drive- E powertrain. XC90’s petrol T6 engines provides 320hp high-performance and uses both supercharging and turbocharging to deliver great power. Our efficient, smooth and responsive Drive-E powertrains prove that you don't need a big engine to get big performance. Each powertrain also complies with Euro 6 emissions standards to make them cleaner and provides great fuel efficiency at 7.7L/100 Km in mixed driving conditions. 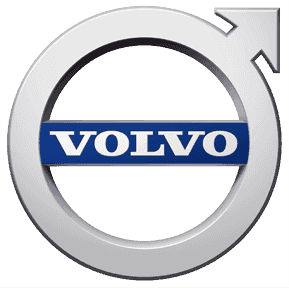 The very highest standards of safety are expected from VOLVO. The XC90 upholds them with its various active systems and robust passive features. The aim of IntelliSafe is to make driving easier to prevent incidents and assist you if they do happen. This brings Adaptive Cruise Control (ACC), Active High Beam and a 360-degree camera to the car among many others. For everyone inside there are multiple strategically placed airbags enclosed within an ultra-strong body. Schedule a test drive in the XC90 with Trading Enterprises to interact with the car in your own way. Contact our showrooms in Dubai Festival City or Abu Dhabi for guidance and to discuss your numerous buying options.